The Second Age: Palin's Pastor Under the Microscope - Seriously? Palin's Pastor Under the Microscope - Seriously? As if we did not get enough of the presidential candidates' pastors - what with Obama's Wright and McCain's Hagee - now Sarah Palin's pastor is being given the once-over. It appears that an influential religious figure in her life - someone who she says helped her win the governorship - was Thomas Muthee. Muthee is an interesting individual, to say the least, as his career doing God's work started with an African witch hunt. Muthee went to Kenya, after he said he was called by God, and outed a witch, who was forced to leave town after the town's residents and police force turned on her. As recent as June, Palin was praising this man as an amazing person who helped her out a lot. Clearly there is something off about this guy. I had been hearing rumors about Palin's church and some of its extreme views (such as their recent "pray away the gay" event), but did not think that they were important enough to post about. After watching tonight's Countdown with Olbermann and its piece on Muthee and his relationship to Palin, I figured I had to write something about it. My first reaction to Olbermann's piece was, "We went through enough of this with Obama and McCain, why are we continuing th is." Then I thought, "Well, to be fair, Obama had to go through this pretty bad, and McCain went through it to an extent, maybe it's only fair that Palin go through it." Then it hit me: there is so much wrong about Palin as a VP choice and a politician, that we do not have to dig so deep into her life that we try to attribute things that other people said or did to her. While the media tried to do this with Obama - that is, finding little controversial about the man on the surface or digging deeper, they grasped at straws with Wright - there really is no need to do it with Palin (and little reason to do it with McCain either, but his past had already been exposed in 2000). 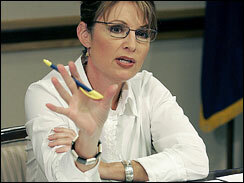 Palin creates enough negative press by herself (see here, here, and here) without needing to get desperate with it. In fact, by digging up crap like this, it opens up the attack of hypocrisy to those who cried foul over the Obama-Wright scandal. It also distracts voters from the real issues - like Palin lying about the "Bridge to Nowhere" or McCain flip-flopping on AIG or calling the economy "fundamentally strong" as Wall Street was on the brink of collapse. So did Palin say very laudable things about Muthee, a nutbag for lack of a better word? Yes, but she was also in front of the church crowd and could have been pandering to them (she is a politician, you know). So trying to tie Muthee's crazy actions with Palin's beliefs is a stretch and it makes those trying to make that connection look desparate. Obama's campaign thus far has not touched this, and hopefully they will not (they already erred in the desperation department by jumping on Rove's comments). If the media jumps on it they will open themselves up to criticism of "liberal bias." Again, there are so many lies and mistruths to point out in the McCain-Palin ticket that needs to be reiterated to the public and it is this kind of stuff that should be highlighted, not crazy pastors with tenuous ties to Palin. Peace.